Effective policing is an important component of good governance. The Punjab Assembly recently approved a new police bill for the state, having replaced the Police Act of 1861. Himachal Pradesh and Haryana have already passed their police Bills. Jammu and Kashmir is dithering on the issue, postulating insurgency in the state as an excuse. Superstar Rajnikant will be waxed into immorality at Madame Tussaud’s Museum in London. Created by wax sculptor Marie Tussaud, the museum exhibits replicas of the world’s well-known personalities. It houses Indian personalities like Indira Gandhi, Rajiv Gandhi, Amitabh Bachchan, Aishwarya Rai and Shah Rukh Khan. With a receding hairline, the 57-year-old Rajnikant is all set to join the galaxy of world personalities at Tussaud’s. The Haryana government has decided to set up District Planning Committees in all the districts. It fulfils the constitutional mandate under Article 243 ZD. Though the government had notified rules for the constitution of these panels as far back as March 12, 1997, successive governments failed to implement it. In an opinion piece in The Telegraph (Kolkota), Dr Ashok V. Desai, the celebrated columnist, has voiced appreciation of the oratorical skills of Nehru, Winston Churchill and Hitler to run down Gujarat Chief Minister Narendra Modi’s gift of the gab. Indians of my generation had been hearing Nehru long before his ringing Tryst with Destiny peroration in the Constituent Assembly at the dawn of Independence at midnight on August 14, 1947. Former Union Law Minister and BJP general secretary Arun Jaitley has been the man with the Midas touch for his party. He has delivered the goods in most states where he was put in charge of the party’s strategy and campaign including Madhya Pradesh, Bihar, Punjab and Gujarat. Three out of four states in the region have an effective two-party system, which encourages good governance. The Police Act is an important piece of legislation with far-reaching and significant ramifications for the common people and society at large. A sensitive, people-friendly police adds tremendous value to the virtues of civilised living. However, it is a matter of concern that governments of the region have not paid the kind of attention to the issue of policing that it deserves. The existing police setup needs immediate overhaul. The Supreme Court noted that “time had come to rise above limited perceptions to bring about some drastic changes in the shape of reforms and restructuring of the police before the country is overtaken by unhealthy developments.” It attributed the present distortions in the functioning of the police to the Police Act of 1861 and hence the pressing need for immediate police reforms. On September 22, 2006, it issued directives to the Centre and states for immediate compliance until they frame “appropriate legislation” replacing the existing Act. The directives are aimed at eliminating unwarranted pressure on the state police, promoting its functional autonomy and ensuring accountability for its omissions and commissions. These include, the setting up of state security commission in each state to lay down policy guidelines for the police and evaluate their performance; minimum tenure for the Director-General of Police and other operational officers; setting up of a Police Establishment Board headed by the DGP to examine police transfers, promotions and postings; and setting up of independent state and district-level complaint authorities with binding powers to look into public complaints of police misconduct. The court’s directives distil the recommendations of several national reports on police reform over the last 25 years and should have served as a significant reference point in the drafting of police legislation by the states in the region. Regrettably this has not happened. Haryana, however, has a 10-member body with three non-government members, of whom one shall be a retired IPS officer, one a retired IAS officer and another member from public service, legal profession or social organisation, all appointed by the government. The government and its loyal retired officials thus dominate the Board. In Punjab, the State Police Board shall have six members and no civil society representatives. It is composed of the Chief Minister, Home Minister, Advocate-General, Chief Secretary, Home Secretary and the DGP. The very purpose of establishing a body with sufficient checks and balances to prevent undue political pressure on the police is defeated under the new police laws of Haryana and Punjab. Similarly, in Haryana, functional autonomy of the police is a major casualty. The Police Establishment Committee, instead of looking after crucial internal functions of transfers, promotions and postings of police as envisaged by the Supreme Court, is mandated to improving infrastructure, modernisation and training. This deliberate omission will continue to place police officials at the mercy of their political masters and unwarranted political interference in the internal functioning of the police will persist unchecked. Himachal Pradesh and Punjab, however, have given sufficient teeth to their police establishment committees in matters of internal functioning. On the crucial issue of police accountability for wrong doings, the police laws of the three states disappoint in varying degrees. The Punjab legislation is below expectations because accountability of the police for its misdeeds gets a cursory mention in one sentence, “the state government may notify and constitute a State level Police Complaint Authority as and when required.” There is no mention of District Complaint Authorities. It is a serious lapse in the proposed law. More than half the complaints received by the Punjab Human Rights Commission are against the state police. The Commission has neither independent investigation machinery nor binding recommendatory powers. The setting up of an effective complaint redressal mechanism under the new police law would have gone a long way to address a major need of the people. Haryana too pays a token tribute to police accountability by establishing a single-member complaint authority, without binding powers, to be headed by a retired judge, retired civil servant or an experienced criminal lawyer. Why has the government chosen to keep the option of a retired bureaucrat or a lawyer to be appointed as the authority’s head when it involves investigative and judicial functions? The absence of District Complaints Authorities is a major gap in making redressal of complaints against the police accessible to the people. More so because in Haryana, the police are often accused of bias against the weaker sections of society and the state does not have a Human Rights Commission. Admittedly, Himachal Pradesh is the most progressive of the three states. However, it too falls short of the benchmark set by the Supreme Court on police accountability. It establishes a single-member State Police Complaints Authority consisting of the Lokayukta to receive and inquire into allegations of criminal misconduct by police. Thankfully though, the recommendations of the authority are binding on the state government. However, it creates District Complaints Authorities headed by the Divisional Commissioner and consisting of three other non-official members, which are mandated merely to forward complaints received to the state authority. The archaic and colonial Police Act of 1861 and the Punjab Police Rules, 1934, have hitherto governed Himachal Pradesh, Haryana and Punjab. The opportunity to enact new police laws incorporating contemporary policing needs, concerns and priorities of the public and the police in these states was an ideal means to effect an overhaul of the existing police systems. This opportunity does not appear to have been taken up in earnest when one examines the new laws passed in Himachal Pradesh, Haryana and Punjab. World famous for his stunts, Ranji’s dialogues have fans in Japan and China. Muthu, a film starring Rajni was the first Tamil film to be dubbed into Japanese as Muthu: The Dancing Maharaja. Most Chinese admire him for his action-packed sequences and rugged body language. It is said if Raj Kapoor conquered the Russians and Amitabh the Lebanese, Rajni seems to have carved up a major chunk of the Eastern belt for himself. In China, the youth watch on DVD system, Rajni delivering punchy dialogues to villains and romancing his lady love in caste Chinese. In Malaysia, a large number of Malay-speaking Chinese and Japanese are Rajni fans. Having acted in as many as 173 movies, including Telugu, Kannada, Malayalam, Hindi and Bengali movies, Rajni became super-hero. By December, the superstar will create history by becoming the first Indian hero to be featured in an animated film. The 3D animated Sultan — The Warrior will be an action-packed adventure movie, featuring Rajni as a mythological and larger-than-life hero. The 90-minute film will be offered as a gift to the superstar on his birthday by his younger daughter Soundarya Rajnikant. Directed by her, big names like music director A.R. Rehman, lyricist Vairamuthu and art director Thotta Tharani, besides a Hollywood stunt master, have been associated with the movie. Rajni himself will lend his voice to the animated version. Already in production, the movie may turn out to be India’s most expensive animated film. Those associated with its production say, it would be a treat to both children and adult alike, particularly to large Rajni fans. 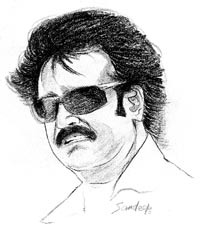 Now known to be the filmdom’s highest paid veteran, his last film Sivaji: The Boss grossed Rs 150 crore. Rajnikant was born in a Maharashtrian family based in Karnataka. His real name was Shivajirao Gaekwad. Coming from an ordinary family, he had a difficult childhood. In his youth he eked out a living by doing all kinds of odd jobs in Bangalore. He once worked as a bus conductor. This was, perhaps, the reason why he connects so well with the masses. Side by side with odd jobs, he attended a theatre for stage plays. It was during this time that he nurtured his acting interests by performing in various stage plays. Later, he went on to do a formal course in acting in Chennai.After years of struggle came Katha Sangama, his Kannada debut film in 1975. Initially he had to do with mere supporting roles, mostly those of villains and after much initiation came the lead roles. The acceptance of Rajni sans his mannerism testified that a star was born. From then, there was no looking back for him. He rose from strength to strength. He made his entry into the mainstream Hindi cinema with Andha Kanoon. Those who have worked with Rajni say that ego and starry airs are unknown to him. Even in breaks during shooting, he would hardly ever rush to air-conditioned makeup rooms. Instead he would prefer to sleep on the sets, even without a pillow, merely covering his eyes with a wet cloth. In 1980s at a crucial phase of his career, Rajni abruptly chose to quit acting, but was persuaded to return. Those in the BJP should learn to maintain decorum and decency from Congress President Sonia Gandhi. The BJP leadership at the Centre and in the states should learn basic etiquette from her. They tend to lose patience very easily. This time, Himachal Pradesh will witness a new phase of development and progress. We will not discriminate on the basis of regions as was done by the previous Congress government. The patch of disappointment between 2004 and 2007 is over for the BJP. The poll outcome in Gujarat and Himachal Pradesh would change the country’s political scene. It is up to the media men to speculate whether I am inching closer to the BJP. As for keeping my options open for an electoral alliance, I think that is the obvious inference, definitely. In an ideal world, after the Rs 1-lakh small car has been launched and is successful, that would be a nice time for me to exit. If the defining struggle of the 21st century is between China and the United States, China will have the advantage. If the defining struggle is between China and a revived Western system, the West will triumph. America’s way of selecting presidential candidates through the primaries is good. Americans will soon make a freer and better-informed choice than citizens in other democracies ever can. Leading a normal life — meeting friends, enjoying adda sessions — is my priority now. I have an ideological resistance to television. While it is an output medium, in theatre and culture, it is the input that is important. Cinema and television completely grab you. In theatre, you can pursue other activities as well like the way I did. In Bihar, Goa, Karnataka, Kerala, Manipur, Rajasthan, Tamil Nadu, West Bengal, Andeman and Nicobar Islands and Dadra and Nagar Haveli, the chairperson of the District Panchayat (Zila Parishad) has been appointed as the chairperson of the District Planning Committee. In Himachal Pradesh, Madhya Pradesh and Orissa, a Minister has been made its chairperson. In Haryana, as in Lakshadweep, the Deputy Commissioner (DC) of the district will hold this post. There is nothing wrong with this decision because it is within the framework of the Constitution. Article 243 ZD empowers the government to frame rules for the constitution of the District Planning Committees and for the mode of appointment of its chairpersons. Thus, the government’s decision is constitutionally valid. However, one cannot lose sight of the drawbacks of this decision. Critics consider it as a retrograde step. First, it is a violation of the spirit of the 73rd and 74th Amendments to the Constitution. While Article 243G inserted by the former assigned the role of planning for economic and social justice to the panchayati raj institutions, Article 243W incorporated by the latter conferred the same on the municipalities. These had envisaged no role for the DC in this context. Secondly, Article 243 ZD dealing with the composition of the District Planning Committee has four-fifth of the membership of this panel earmarked for the elected representatives of the Zila Parishad and Municipalities and only one-fifth share for the nominated members. Hence, instead of the DC, only an elected member should have been made its chairperson. Thirdly, the amendments as cited aimed at democratic decentralisation of the district administration. These sought to make the panchayat institutions and municipalities self-governing institutions. The DC’s appointment to this office would lead to bureaucratic centralisation of the planning process in the district. Fourthly, a DC, overburdened with too many functions, has little time for the challenging task of district planning. The increase in crime and social strife has made it all the more difficult for him/her to spare time for this serious and time-consuming exercise. Fifthly, it is said that as the government’s eyes and ears and being accountable and responsive to it, the DC could not be expected to ensure people-centric planning as envisaged under the Constitution. Sixthly, instead of fulfilling the demands of the elected members of the District Planning Committee, the DC may cater to the wishes of MPs and MLAs who have been made special invitees of this panel, on account of their clout in the power structure of the state. And finally, critics argue that the DC’s appointment will result in centralised, instead of decentralised, planning. For a disapassionate study of the issue, the merits of the decision should also be discussed. The state government might have been influenced by the perception that it was not desirable to appoint a chairperson of Zila Parishad or Municipal Council to this office as the former represented the rural areas and could be biased in its favour and the latter, who represented the urban area, could have a soft corner for it. On the contrary, the DC, being a neutral functionary, could give equal treatment to both rural and urban segments of the district. Secondly, experience suggests that heading a planning institution was too professional for the elected heads of the rural and urban local bodies. Most of them neither have the experience nor the requisite knowledge to play this arduous role. However, the DCs, on account of their professional role as chairpersons of District Planning Boards, could be relied upon for undertaking this responsibility. These boards had the onerous responsibility of formulating the district plan before the creation of the District Planning Committee. Thirdly, the daunting task of formulating the district plan required effective coordination between the elected representative and official functionaries of the panchayati raj institutions and the municipalities on the one hand, and between them and the district heads of the line departments on the other. This could be ensured only by the DCs who have administrative control over the functionaries of both the institutions of rural and urban local government and the district level officers of the line departments. Fourthly, the effective implementation of planning required the support of the general administration over which neither the panchayati raj institutions nor the municipalities have any control. Being the district head, the DC alone could enlist support for this. Fifthly, the formulation of the district plan needed pooling of financial resources of various departments, the District Rural Development Agency, municipalities, panchayati raj institutions. The synergy and convergence of these could be facilitated only by the DC because of his/her hold over all of these. And finally, the DCs could also be depended upon for ensuring that the district plan is in consonance with the objectives of the Eleventh Five-Year Plan, the policies and priorities of the Government of India and the state government. The heads of the zila parishads and municipalities could have an entirely different agenda. Be that as it may, mere constitution of the District Planning Committee with the DC as its head is not enough for the formulation of the district plan which has been made the basis for formulating the Annual Plans of the states under the Eleventh Five-Year Plan by the Planning Commission. Many other steps are needed for this purpose. These include spreading awareness of the people’s active participation in the planning process, strengthening the gram sabhas, constitution of ward sabhas, on the pattern of gram sabhas in the municipalities, capacity building of the elected panchayat and municipal members, and orientation of the District Planning Committee members. Our earliest recollection was of vignettes of his campaigning for the 1937 elections under the 1935 Government of India Act. He was on a whirlwind tour of Madras Presidency. A Kerala friend recalls years later of what stuck in his mind of “a fair handsome person with a powerful wrist flaunting a large Rollex watch striding like a colossus from end to end of South Kanara district. On the lighter side, in Madras, his today’s Chennai, he greets the Premier, as chief ministers were then called, saying “Ready?” and the other responds “Reddier, Sir”. A different picture emerges of his canvassing for V.V.Giri in Bobbili. When the minions of the Raja of Bobbili unleash elephants to disturb Nehru’s public meeting at Bobbili town. Giri was pitted against the Raja of Bobbili, the incumbent head of the Justice Party Government in the Presidency. No road shows and photo opportunities with measly throwing of flower garlands at rented crowds for him. It was a majestic stride through the area. Within the country, Atal Behari Vajpayee, at the height of his oratorical gift, would hold his hearers spellbound. His darts at the then Prime Minister, Indira Gandhi, softened by sweet humour, went home without hurting. For instance, once parodying the family planning slogan, Hum do hamari do, he poked fun at the then Prime Minister and her two sons, Rajiv and Sanjay. It was also a hit at the burgeoning dynasty. Prakash Vir Shastri, who was with the Congress, was no less silver tongued. Later, in the Lok Sabha, the CPI leader, Indrajit Gupta, was a matchless debater. The incumbent Lok Sabha Speaker, Somnath Chatterjee, scion of the celebrated Hindu Mahasabha leader and a High Court judge, N.C. Chatterjee, also belongs to the same league. So is Jaipal Reddy, then with V. P. Singh’s Janata Dal. Every one of them had been a distinguished parliamentarian. Jaipal Reddy has since been shunted out of the high profile Information and Broadcasting Ministry to the backroom Works and Housing chore. Dr Desai could not have missed any of them, if he did not want to. In the United States, there was John F. Kennedy, too bright to be missed, and his elder brother, Robert Bobby Kennedy, besides Dr Martin Luther King, their fellow martyr. For instance, JFK’s imperishable “Ask not what American can do for you, ask what you can do for America” said to be scripted by John Kenneth Galbraith. After the border conflict with China in 1962, when Nehru sought US help in beefing up our air force, while letting the US force undertake ‘Operation Siksha’, Kennedy dispatched a high-powered delegation headed by Averrell Harriman to persuade Nehru to “solve the Kashmir problem” with Pakistan. Then followed several rounds of ‘negotiations’ in Delhi and Rawalpindi between Zulfiqar Ali Bhutto, Pakistan External Affairs Minister, and his Indian counterpart, Sardar Swaran Singh. Swaran Singh had perfected the art of repeating endlessly what he said. The joke about his negotiating style of “South Vietnam is south of North Vietnam and North Vietnam is north of South Vietnam” originated then. A consummate orator, Jaitley (55) has been practising law since 1977. Elated over the BJP’s success in Gujarat and Himachal elections, he feels it will add to the BJP’s resurgence at the national level. Q: How do you interpret the election results in Gujarat and HP? A: The most significant message of Gujarat elections is that a nationalist ideology, good governance and a leader’s integrity and decisiveness pay. It was a mix of three factors — a strong organisation, good performance of the government and the Chief Minister’s personality. In Himachal, it was a verdict against misgovernance. The image of the state government and erstwhile Chief Minister, both on performance and integrity, was poor. The BJP focused on misgovernance and put up a united front. Q: Why was Prof Prem Kumar Dhumal preferred for the top job in HP? A: The BJP has an advantage as both Shanta Kumar and Dhumal have a spotlessly clean image and come from electorally significant areas. It was a difficult choice to make. But once a decision was made, Shanta Kumar accepted it and conducted the campaign in a manner that did the party proud. Q: How will the verdicts in Gujarat and Himachal Pradesh play out on the national scene? A: It has added to the BJP’s resurgence. It has demolished the myth of the vote-attracting ability of Mrs Sonia Gandhi. It has reaffirmed that the Prime Minister is electorally not relevant. More important, it has demonstrated that the party’s strength is its strong position on national security. Q: Do you see more parties being attracted to the BJP? A: If the nucleus is strong, the circle around it will be larger. A strong BJP will lead to a strong NDA. Q: Will the results influence the Lok Sabha elections? A: To the extent it adds to the BJP’s resurgence and the Congress’ demoralisation, it becomes an important factor. Q: What role will Mr Modi play in national politics? A: He will presently confine himself to Gujarat as he is committed to serving the people. He is also an important national leader and will be our very powerful campaigner in the Lok Sabha elections. Q: Did Mr Modi try to polarise the electorate? A: Modi contested the elections essentially on the development plank. The Congress had neither leadership nor could it face Modi on this plank. Sonia Gandhi, therefore, tried to alter the agenda. Q: Did Sonia’s Maut ka Saudagar remark help BJP gain ground? A: In a sense, yes, because it worsened the Congress’ prospect and brought the issue of national security to the forefont. Q: How will Modi’s victory impact the BJP’s internal equations? A: There is no need for us to speculate hypothetically. This victory has enhanced his stature in the whole country. Q: Will it lead to a more important role in the party for Modi? A: He has always been an important party leader. Even before he went to Gujarat as Chief Minister, he was the BJP’s organising secretary — a key organisational post. Q: What about your paty prospects in Chhattisgarh, MP and Rajasthan? A: We are getting ready with the preparation. We have a strong organisation in the states and we will do well. Q: Are you facing anti-incumbency in these states? A: We will take stock of the situation and if correctives are needed, we will take them. Q: Since elections in these states will be close to the general elections, will the feel-good factor for the party be neutralised? A: Election in every state is fought on its own script. Q: How will you strengthen the BJP in UP? A: We must occupy the entire opposition space in UP. It is extremely important for us to do that. The party has to activate itself and become aggressive. We have been holding a lot of protest against the state government’s policies.